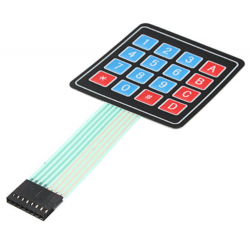 This flexible 4x4 matrix keypad is connected to an 8 pin DuPont Female connector. It can be attached to a surface via the adhesive back by removing the white protective paper backing. A>MINI PORTABLE. 28 keys, portable size so you can carry everywhere anytime, and with Wrist Rest, perfect for one hand control, left or right hand, convenient to control, humanized design. B>1 RAINBOW BACKLIGHT. "Fn + Esc": Turn on/off the light. "FN+3": Increase the backlight; "FN+4": Weaken the backlight, and the backlight will turn off when it is weakest. "Fn + Alt/Ctrl": Switching to the Breathing Light. C>MULTIMEDIA KEYS & SHORTCUTS. Easy-access dedicated multimedia controls, it is convenient and easy to switch between gaming. "Fn+1" equals to F1; "Fn+2" equals to F2; "Fn+5" changes to "m". D>ERGONOMIC DESIGN. Delicate appearance, humanized design, large and soft rubber palm rest ensures you long time using without feeling tired, perfect for single hand user, convenient to control. E>BROAD COMPATIBILITY. Plug and play support, compatible with Windows 8/los/android and other systems. Used with Notebook / Desktop PC. Perfect for the home office or workplace.